The Schiavone family (back row from left): Vincent J., Steven M., Joseph J. and Dr. Michael A. Jr.; and (front) Rita Ungaro-Schiavone and Dr. Michael A.
Forty years ago when Rita Ungaro-Schiavone was doing volunteer social work with the Frankford YMCA, visiting mostly elderly shut-ins, she was struck by their overwhelming needs. In addition to their frailty, she noticed they were lonely and all too often had an inadequate diet. At first she began bringing along frozen home-cooked meals from her own kitchen, but quickly realized much more was needed. She started working through her parish, St. Jerome’s in Northeast Philadelphia, and through the Christian Family Movement at the parish along with the YMCA, and soon Aid For Friends came into being. The heart of the program is still mostly home-cooked and frozen meals provided by volunteers, delivered to AFF headquarters on Townsend Road in the Northeast and delivered by other volunteers who not only bring the meals but provide human companionship. In essence, the volunteers become surrogate families to the shut-ins. Four decades later, the program encompasses volunteers from about 230 mostly churches and synagogues who through weekly visits deliver roughly 460,000 free dinners and breakfast bags yearly to the elderly and infirm. It is only logical that a program that had its beginnings in a parish family program should have strong support from the family of the founder. Rita Schiavone herself, now almost 80, is housebound and could easily be in the position of the many thousands of people befriended and assisted by AFF over these many years, except for the strong support group she has within her own family. 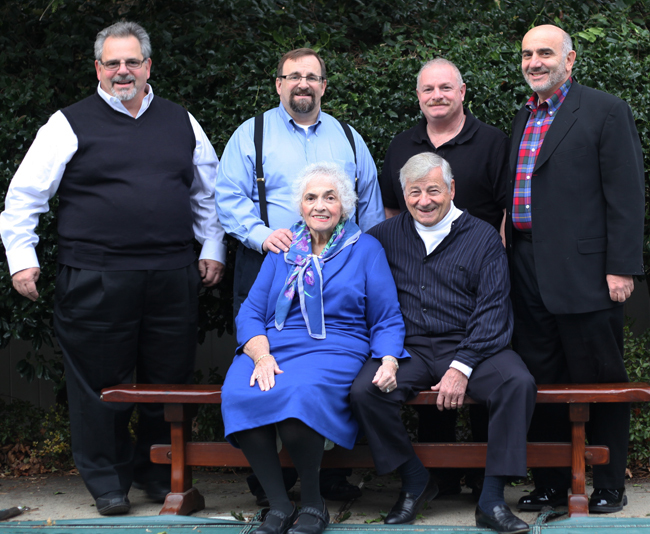 Many of these family members have played important roles in the organization over the past four decades. On the local level that means cooking and freezing dinners that would be stored usually in freezers at churches or synagogues for delivery locally by volunteers, with excess food taken to AFF headquarters for other volunteers to deliver it elsewhere. Msgr. John Jagodzinski knew Rita even before she founded AFF and has been a supporter for the group from the beginning. Still a board member, besides promoting it in his own parishes in the early days, he was especially helpful through his contacts with other pastors. He would call them to explain it really was a worthwhile cause, if Rita was requesting an opportunity to speak to the parish. The oldest son in the family, Michael, who is a member of Our Lady of Guadalupe Parish in Buckingham, an Iraq war veteran and ob-gyn doctor, would visit shut-ins and accompany or fill in for his parents for recruiting visits mostly to churches. His son, Michael Angelo, promoted AFF when he was a student at Grey Nuns Academy and at Holy Ghost Prep in Bensalem, where the work still carries on to the point that the 40th anniversary celebration was hosted by Holy Ghost. Vince, who belongs to St. Norbert Parish in Paoli, is a board member, wrote software for the organization and trained volunteers how to use it. His kids Peter and Grace ran a lemonade stand to support AFF and donated the money they earned doing household chores to the cause. Joe, who is a member of St. Martin of Tours Parish in New Hope, is a Philadelphia police officer and still makes it his business to keep an eye on AFF’s Townsend Road headquarters where the food is stored awaiting delivery. His son Matt is now an unpaid intern, helping with the website and graphics for promotional material. Another son, Michael Joseph, assisted AFF for his Eagle Scout project, and his troop at Our Lady of Calvary Parish still supports it through meal preparation. Joe’s daughter Nicole promoted AFF when she was a student at Archbishop Ryan High School, and that continues to this day.